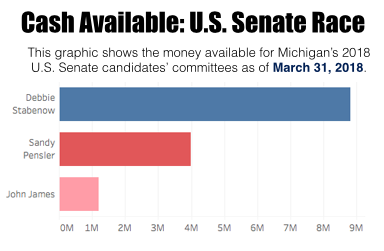 Where Is The Money Coming From In Michigan's Race For The U.S. Senate? LANSING (JULY 9, 2018) — While candidates and outside groups are spending millions of dollars on TV ads in Michigan’s race for governor, the state’s U.S. Senate race has been much quieter. As of Monday, July 2, only one candidate had aired broadcast TV ads in the U.S. Senate race in 2018, according to MCFN's analysis. In the governor’s race, six candidates and eight other groups had run TV ads as of July 2. But Michigan voters can expect more Senate ads in the months leading up to the Nov. 6 election. According to campaign finance disclosures, the state's three major-party candidates for U.S. Senate combined to raise $20.5 million by the end of March. They reported having $13.9 million still available to spend on April 1. Their next campaign finance disclosures are due July 15. Michigan’s U.S. Senate race is one of 33 that will be on the ballot nationally. The races will decide whether Democrats or Republicans control the chamber. The Michigan seat is one of 10 Senate seats up for election that are currently held by Democrats in states that President Donald Trump won in 2016. The Democrat trying to keep the Michigan seat is U.S. Sen. Debbie Stabenow, of Lansing. She was first elected to the U.S. Senate in 2000. She’s been the top fundraiser in the state's 2018 race so far. She’s raised $13.2 million since her last election in 2012, according to her campaign finance reports. Two Republicans are hoping to challenge her in the general election. They are John James, a businessman from Farmington Hills, and Sandy Pensler, a businessman from Grosse Pointe. James had raised $2.1 million as of the end of March, and Pensler had raised $5.1 million. The following is a look at who’s been financially supporting each of the candidates, according to campaign finance disclosures. 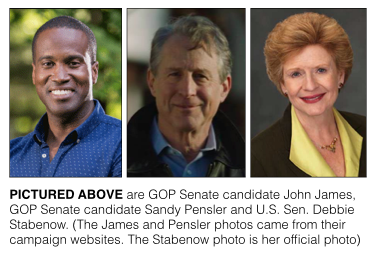 Stabenow has easily raised the most money of Michigan’s 2018 U.S. Senate candidates. She also had the most money still available as of the beginning of April: $8.79 million. Political action committees (PACs) have contributed $3.1 million of the $13.2 she’s raised, according to the disclosures. A wide variety of PACs have made maximum contributions of $10,000, including Comcast, the Credit Union Legislative Action Council, the National Education Association Fund for Children & Public Education, the General Motors Company PAC and the United Steel Workers Political Action Fund. Some of the individuals who have made maximum contributions of $5,400 — $2,700 for the primary and $2,700 for the general — are Marilyn and Jeffrey Katzenberg, Stewart and Lynda Resnick and Charles Merinoff. Jeffrey Katzenberg is the former chairman of Walt Disney Studios, Stewart Resnick is CEO of The Wonderful Company, and Charles Merinoff is co-chairman of Breakthru Beverage Group. The group that’s disclosed spending the most money independently of Stabenow’s campaign to help her has been the American Chemistry Council, which disclosed spending $571,700 on TV ads last fall, according to a federal filing. The ads, which aired in November and December 2017, encouraged Michigan residents to contact Stabenow “to tell her to keep fighting for Michigan values,” according to a press release from the American Chemistry Council. The ads were sponsored by both the American Chemistry Council and North America's Building Trades Unions, according to their disclaimers. As of Monday, July 2, Pensler’s campaign had been the only Senate campaign airing its own broadcast TV ads in Michigan. And the Pensler campaign had aired a lot of them. The campaign, which launched its broadcast ads in March, had sponsored an estimated $893,000 in broadcast ads of July 2, according to MCFN's analysis of Kantar Media/CMAG ad-tracking data. The total doesn’t include spending on cable ads, which the campaign has also been airing. The money for the ads has primarily come from Pensler’s own pocket. He’s personally loaned his campaign $5.0 million of the $5.1 million the campaign has reported raising, according to his disclosures. The campaign has received some large contributions as well, including $2,700 from Matthew Moroun of Central Transport and $5,400 from Clifford and Terry Dirksen of Dirksen Screw Products. So far, there’s been no disclosed independent spending to benefit Pensler. While Pensler’s self-financing is giving him a large financial advantage over James, who is Pensler's primary opponent, James has received support from some top GOP donors and additional independent support. James’ campaign had raised $2.1 million as of the end of March. His contributors included some heavy-hitters in Michigan Republican politics. Members of West Michigan’s DeVos family had contributed $13,600 to the James campaign. Peter and Joan Secchia gave $10,800. Peter Secchia is a businessman and a former ambassador. Peter Karmanos, co-founder of Compuware, John Rakolta, CEO of Walbridge, and David Fischer, chairman of Suburban Collection, had each given $5,400, according to campaign finance disclosures. All five of those families were among the top 30 political donors from Michigan for the 2016 election, according to MCFN’s analysis. As for outside support, the Senate Conservatives Fund has disclosed spending $90,183 on independent marketing and fundraising efforts to help James’ campaign. On the group’s website, the organization, which also helps campaigns raise money, says it’s worked to “invest” $268,273 in James’ campaign.